Quinns: Good morning, my sweet creatures of the table. 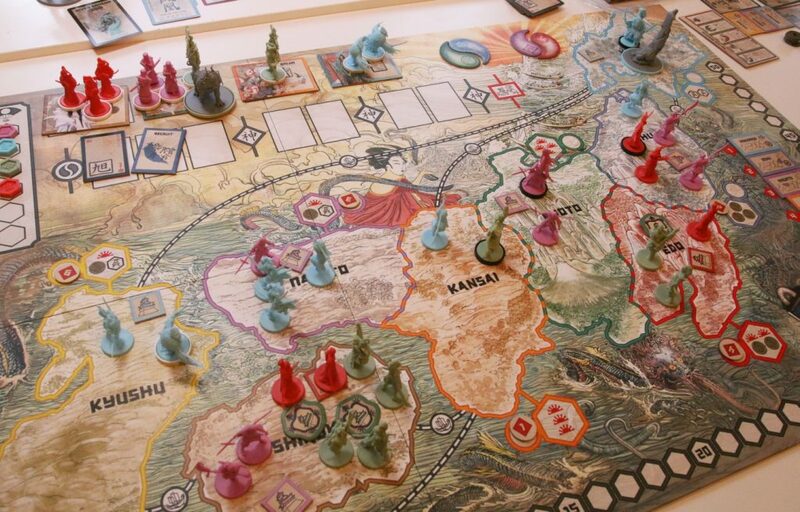 There’s only one story that could possibly kick us off this week: How a Random New Zealand Man Became a Character in Rising Sun. To summarise, CMON’s ludicrously successful Kickstarter game, Rising Sun, was this month shipped to some 32,000 backers only for a few people to begin asking about this “Kotahi” stretch goal miniature. 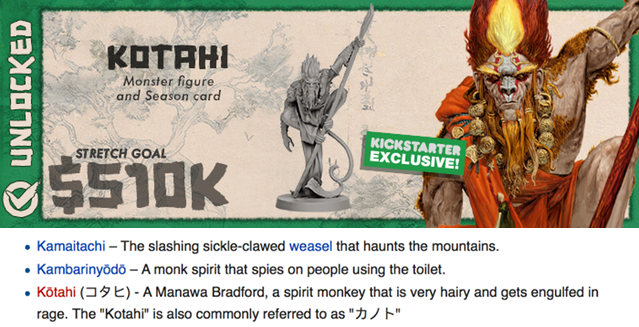 The backers couldn’t find any Japanese folklore by that name, but they did find a fake Wikipedia entry where someone put their friend, Kotahi-Manawa Bradford, in Wikipedia’s list of Japanese mythical creatures as a joke. In other words, research for Rising Sun was being done via Wikipedia and as a result a random Maori guy was immortalised in CMON’s biggest release of the year. CMON have since stated that they were indeed “tricked”, and have sent a couple of copies of the game to Kotahi and his friend in a coy bit of PR, but I’m not sure they come out of this looking good. This is a funny story, of course, but it’s also kind of shocking? It’s bad enough that an established publisher raised over $4 million doing its character design via the sort of cursory Wikipedia-surfing that 13-year-olds get stern warnings about, but these corners were cut while exaggerating the imagery of another culture. If anything, CMON got lucky. What if the Wikipedia edit had been by a racist troll? The tale of Kotahi is the kind of story where your laugh, then wince, then stare into the middle distance for a bit. 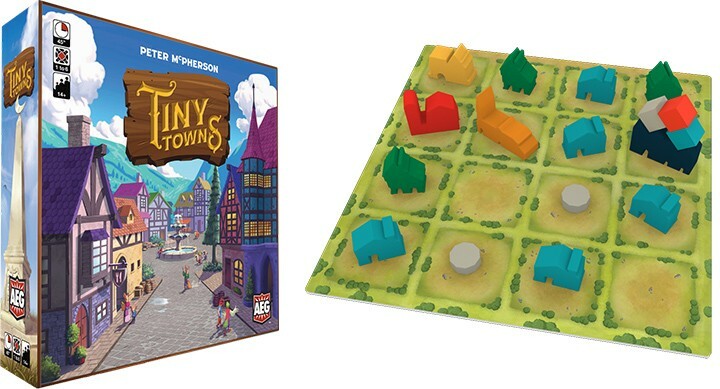 Moving swiftly on, one of the things I truly love about the industry is all of the board games that expose me to cultures or areas of history that I might never have heard of. On that note, an English second edition of Targi, a game sitting very high in the BoardGameGeek rankings, has been announced for later this year, and it’s expected that the first English-language release of the expansion won’t be far behind. 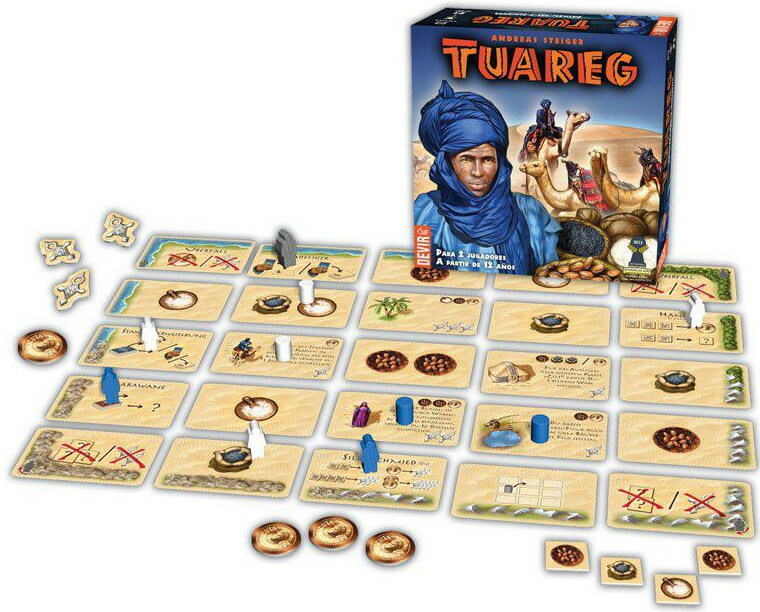 The game is based on the Tuareg people, a matrilineal Muslim confederation who live in the Sahara and where the men wear a veil instead of the women. As for the game, it’s a 2 player worker placement game where you each position your tribespeople around the edge of the ‘board’ to get the chosen reward and block your opponent, but where the x and y axis of your workers points to a card in the middle of the layout that you then take. All of this is done in a race to claim resources of salt, pepper and dates, and sell them for fabulous gold. I’m excited even though I don’t like dates, though I’m praying for something a little prettier than the 2013 first edition, pictured above. This industry’s come a long way in the last five years, and Targi is in that tricky teenage phase where it isn’t old enough to look “classic” but isn’t young enough to look cute. 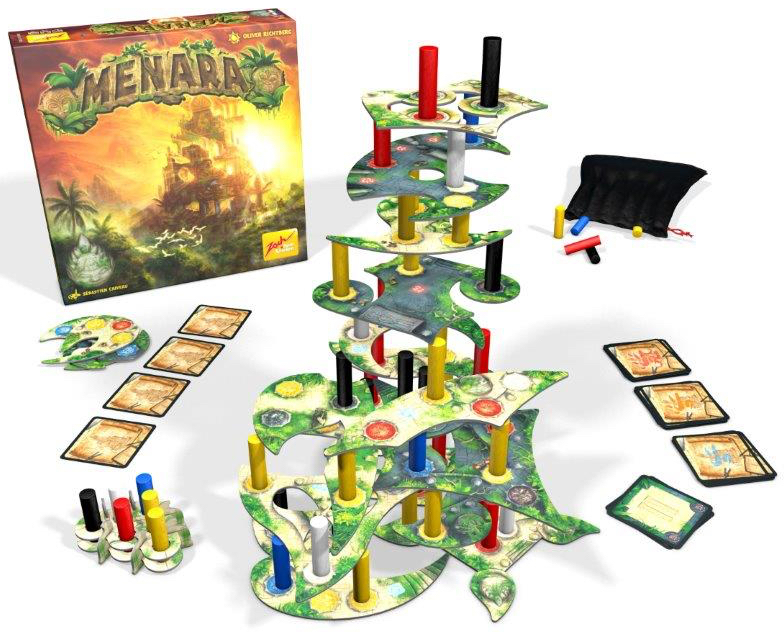 On the other hand, Menara is another 2018 release that isn’t inspired by a real place, though I sure wish it was! That’s all we know right now. Worse, I don’t even know what “static skills” are. It sounds like a real backhanded compliment. Or maybe it refers to someone who’s really good at rubbing balloons and making them stick to things? Kero is another interesting-looking 2018 release, this one from Prospero Hall, the talented studio that brought us Shifty Eyed Spies. The game has yet another post-apocalyptic setting, but if I were you I wouldn’t let that put you off. See the trucks in the above photo? There are sand timers in them. “Each player has their own sandtimer that holds about sixty seconds worth of sand. On a turn, you must start your sandtimer, then roll the dice however many times you want, keeping results as desired and keeping fire because you have to. 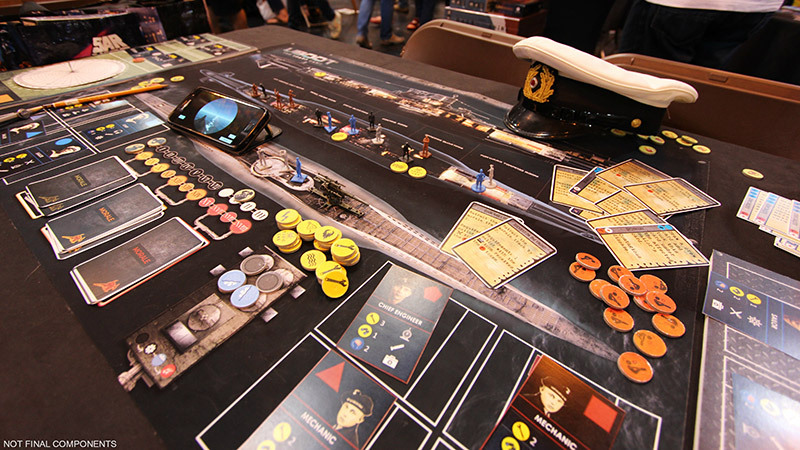 With the results of the dice, you purchase buildings and supplies that add to your holdings. Some buildings allow you to place soldiers in different territories, and three battles take place during the game for control of them. You can also gain special ability cards that modify actions or provide points. Kero sounds curious, and it looks lovely. I can’t wait to try it. In 2016 we had Clank! 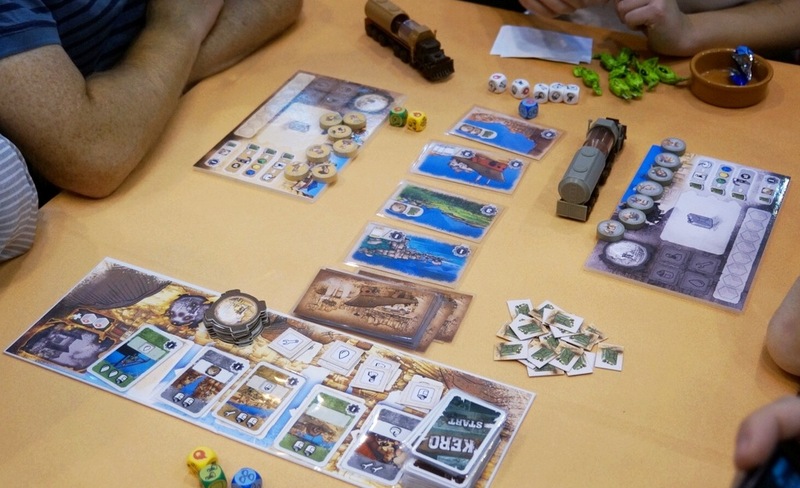 : A Deckbuilding Adventure which Paul played and thought was fine. In 2017 it was followed by Clank! In! Space!, which Matt and I played and thought was fine. So, who wants more Clank!? That’s a rhetorical question, we’re getting some more Clank. Clank! 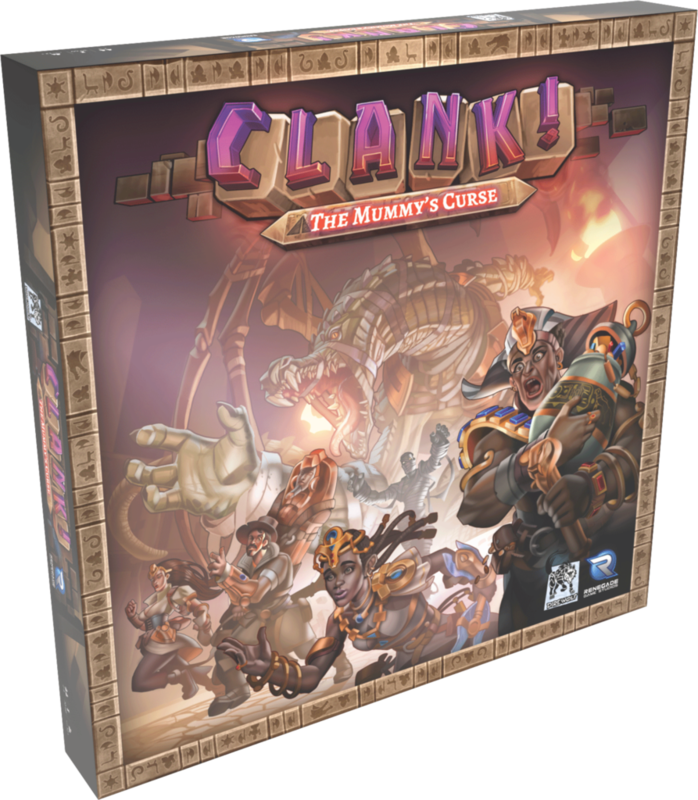 : The Mummy’s Curse will be the second expansion for the original Clank! following on from Clank! : Sunken Treasures, and will add a new dungeon with a wandering mummy to the beloved game of burglary. I don’t want to sound too down on a series which has some gorgeous art, cool ideas and fun tension. Team SU&SD just felt that Clank! owes more to the intrinsic joy of deckbuilding than it does to the game design. 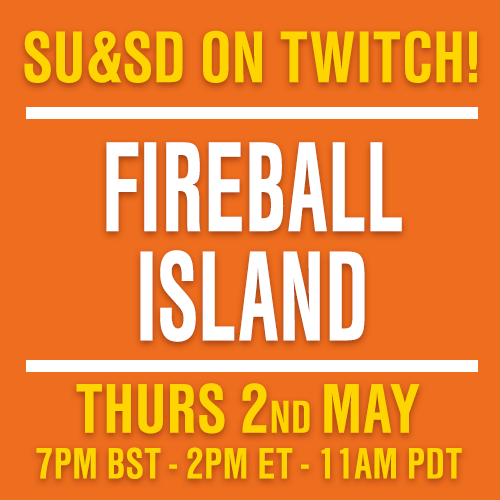 If it’s the first or second deckbuilding game you’ve played, you’re going to have an amazing time with it, but if it’s your eighth, you might be a little bored (a problem that our team is starting to recognise in more and more deckbuilders). True story: Last week I had a nightmare about being chased by mummies that was so scary I woke up my wife for someone to talk to. Also, this week we watched the 1999 film The Mummy in honour of my nightmare. Holy cow it’s bad. Rachel Weisz is forcibly kissed by both the protagonist AND the mummy, both of whom she later voluntarily kisses in separate scenes. Basically she only survives by being hot and giving kisses to people. 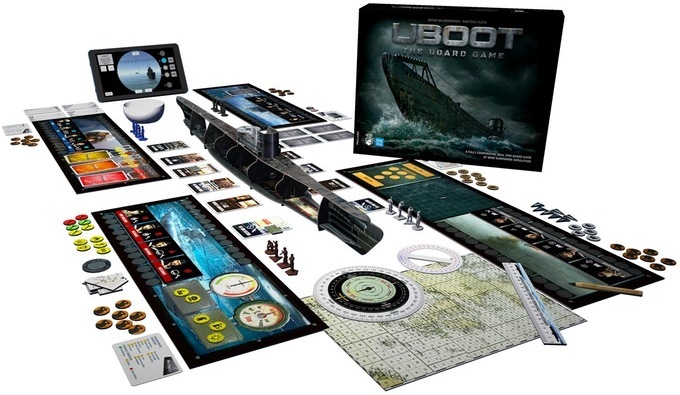 We move onto this week’s best new Kickstarters, starting with UBOOT The Board Game. We first wrote about this co-operative WW2 war game back in November 2017 and now the crowdfunding campaign has finally surfaced and is heading towards a cool £500k. I didn’t realise that the companion app functions as a periscope! That’s bananas. 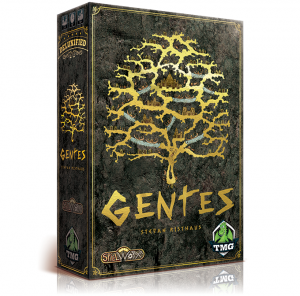 But Gentes – Deluxified™ Edition is the Kickstarter that’s caught my eye this week. I like to think I’m pretty good at understanding games at a glance, but first with Arkwright and now Gentes designer Stephen Risthaus seems capable of making heavy, complicated games that I can’t understand no matter how long I stare at either the pictures or the words. 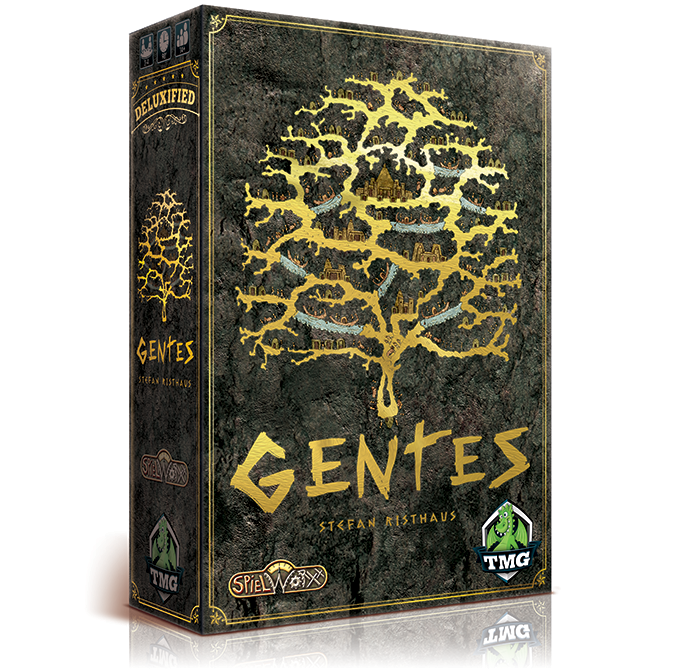 Basically, Gentes is a game about civilization, but not like Civilization, with an innovative timing mechanic where players flip over hourglasses, but not real hourglasses. Cardboard hourglasses. Apparently his games are good? I should probably play one. Maybe this one. It’s deluxe, after all. 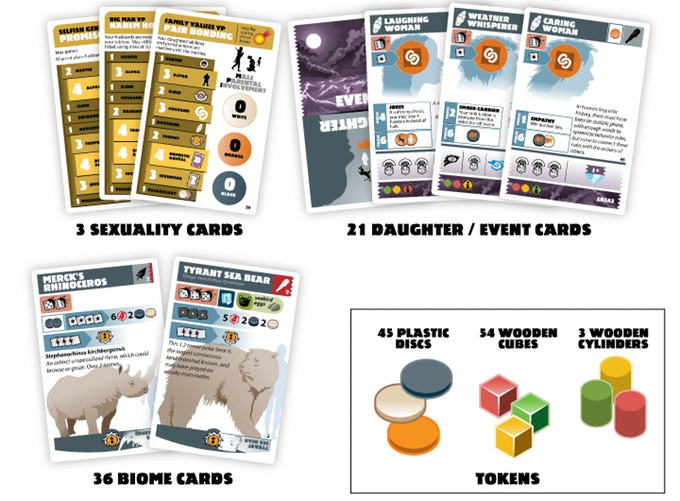 And finally, I had a miserable experience with the only Phil Eklund game I’ve played but this Kickstarter for the new, beautified editions of Greenland and the prequel Neanderthal has me wanting to give him another shot. Eklund is a cult designer and literal rocket scientist who makes obsessively researched, incredibly nuanced games that, for whatever reason, are compressed into approximately one million cards in a tiny box (with each card bearing one thousand words) and sold via a 1990s-era website (where the front page has a picture of him hanging out in a swamp).